Topi is a boy I remember first hearing about many years ago when I was just entering the world of the Finnish Lapphunds. A breeder from the UK had spent the weekend in Finland at their speciality show and was sharing her experience on an international Lapphund chat group. 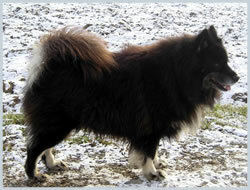 I remember vividly her describing how she had seen many beautiful Lapphunds that weekend, but just one that "took her breath away", a male by the name of Lumiturpa Taatsi. I was intrigued, but couldn't find a lot of information about him at the time. 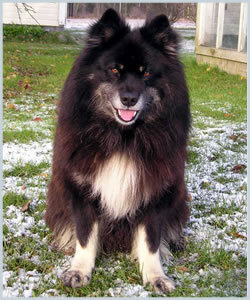 And it was over a year later, when arranging for my own beautiful Lumiturpa Finnish Lapphund, the lovely Emmi, that I discovered that the person who was raising my girl also happened to be the owner of the not quite forgotten in my mind Lumiturpa Taatsi. Johanna and I became friends over the time Emmi was with her, and when I visited in March 2007, I was looking forward to finally seeing this lovely boy. I wasn't dissapointed. Topi is a very solid, very typey Lappie, of ideal height, with a strong head, magnificant full coat, and a muscular compact body. He is a very dark faced boy, with his markings a faint, almost grizzle grey, and his "eyebrows" barely two tiny dots above his eyes, offset with full tan points on his legs, and a white chest. Sadly he is no longer with us, but hopefully one day we will get to see his progeny arrive in Australia.